Engineering researchers at the University of Arkansas have developed a thermal energy storage system that uses parallel concrete plates. The new system is a structured thermocline system which can be bodies of water, such as oceans and lakes, for example, but also smaller units that contain fluids or gas – with distinct boundaries separating layers that have different temperatures. The plates are made from a special mixture of concrete developed by Micah Hale, associate professor of civil engineering. The mixture has survived temperatures of up to 600º Celsius, or 1,112º Fahrenheit. The storage process takes heat, collected in solar panels, and then transfers the heat through steel pipes into the concrete, which absorbs the heat and stores it until it can be transferred to a generator. Currently the popular storage methods use molten salts, oils or beds of packed rock as media to conduct heat inside thermal energy storage tanks. Although these methods don’t lose much of the energy collected by the panels, they are either expensive or cause damage to tanks by corrosion and/or expansion and contraction. Today’s most efficient and least expensive method, the use of a packed rock, leads to what is called thermal “ratcheting,” which is the stress caused to tank walls because of the expansion and contraction of storage tanks from the thermal cycling over changing temperatures. 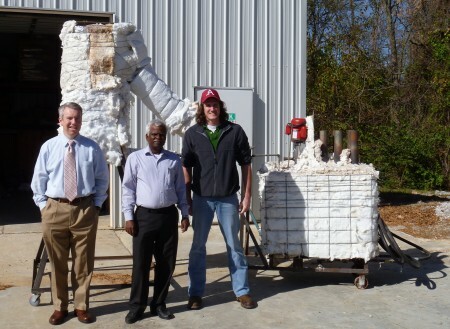 U of Arkansas Concrete Thermocline Team. Click image for more info. Selvam and his team developed the concrete based thermal energy storage system to work as a viable alternative to current methods used for storing energy collected from solar panels. The team knows incorporating the researchers’ design into the operation of a concentrated solar power plant will dramatically increase annual energy production while significantly decreasing production costs. Modeling results showed the concrete plates conducted heat with an efficiency of 93.9 percent, which is higher than the Department of Energy’s goal and only slightly less than the efficiency of the problematic packed rock bed method. Tests also confirmed that the concrete layers conducted heat without causing damage to materials used for storage. In addition, energy storage using the concrete method cost only $0.78 per kilowatt-hour, far below the Department of Energy’s goal of achieving thermal energy storage at a cost of $15 per kilowatt-hour. The work is several years in the development. Selvam, holder of the James T. Womble Professor of Computational Mechanics and Nanotechnology Modeling, received a $770,000 award in 2008 from the U.S. Department of Energy to develop a novel method of storing thermal energy in concrete. The award and research project were part of the federal government’s initiative to develop technology for low-cost energy storage of solar power. The system is a huge improvement on current technology. The liquid systems demand maintenance and ongoing expense plus risks of a spill, gas systems need pressure to operate with machinery to get that work done, and the packed rock is very difficult to compensate for the temperature cycling. The concrete is sure to be a highly specialized recipe, something that a wide array of thermal storage people are going to want to know about in detail. The new concrete and carefully selected steel tubing could last for decades or longer and run at very low pressures. The Arkansas team has just rounded the first base, as the concrete know how gets around others are going to be looking at getting to lower costs, simplified construction, efficiency gains and a much, much wider market place. Thermal storage made cheap enough might finally make time shifting air conditioning heat dumps to nighttime’s cooler temperatures a viable money saver. It’s worthy work, well done. Incredible cost projection — under $1/kWh !!! Are these folks looking to commercialize this idea or is their IP publicly owned, since they got DoE grant money?